Need more information about booking Property 5337640 ? An Authentic ancient residence, built in the nineteenth century, Dimora Amalfitana is a unique and elegant jewel of around 400 square meters completely renoveted, overlooking one of the most scenic corners of the Amalfi Coast. Thanks to the recent renovation and restructuring work, the Villa now boasts of a harmonious balance between state of the art technology and the elegant original features which have been painstakingly preserved in line with the history of the house. An ancient staircase with artistic handrails inlaid in wood connects the four levels of the villa characterized by vaulted ceilings, original brick floors of Ogliara, old parquet and original hand-crafted majolica tiles. All the rooms are handsomely furnished with elegant antique furniture, precious paintings, objects and tapestry of value which is beautifully complemented by striking views of the sea and the coast. Overture, Rapsodia, Suite, Fantasia, Romance, Arabesque, Melodia and Fuga are the names assigned to each of the eight elegant bedrooms of the villa, a choice that recalls the most famous pieces of the classical music and accentuates the clear classical reminiscences, present everywhere and harking back to the ancient splendour of the nineteenth century house. All rooms, including six double bedrooms and two convertible twin rooms (on request), are equipped with comfortable living rooms and bathrooms en suite with a hydro massage shower and /or Jacuzzi, embellished by bright glass mosaics, matching to the blue/emerald colour of the sea. Comfortable and refined, the bedrooms are equipped with all modern conveniences (LCD satellite TV, internet Ethernet, minibar, safe, hairdryer, independent air conditioning system) and are illuminated by balconies and windows overlooking the unrivalled beauty of the coastal scenery. The entrance of the villa, located on the first floor on the street level, opens itself on to a reception area with info / internet point and a magnificent living room, furnished with fireplace, ancient library and TV LCD flat 40. The same level hosts an outside parking place for one vehicle, fitted with an electrical gate.The sobriety and simplicity of the architectural lines blend majestically with the natural facets of the rock in sight and aptly characterizes the entrance corridor to the ground floor of the Dimora Amalfitana. The dining room comes equipped with a hardwood extensible table and TV LCD flat 40, a loft with double room with bathroom en suite, a small cellar cut into the rock and a fully equipped kitchen (5 professional stove burners, dishwasher, oven, microwave oven, coffee machine, refrigerator, freezer) with laundry corner (washing machine, dryer). A panoramic terrace of about 60 square meters, illuminates the lower floor of the villa offering the guests an ideal place to partake in total relaxation and privacy while also enjoying pleasant outdoor meals. The lower floor gives access to the extraordinary outdoor space of the Villa, extending 1500 square meters of private park, distributed on a large terrace adorned with bougainvillea pergola. This is an ideal equipped location for hosting small exclusive events amidst its panoramic terrace gardens, sloping down towards the sea, equipped solarium, gardens equipped with outdoor kitchen and barbeque, wellness area, panoramic outdoor Jacuzzi (4,3 x 2,3) with upstream swimming and platforms on the sea with small private landing place. 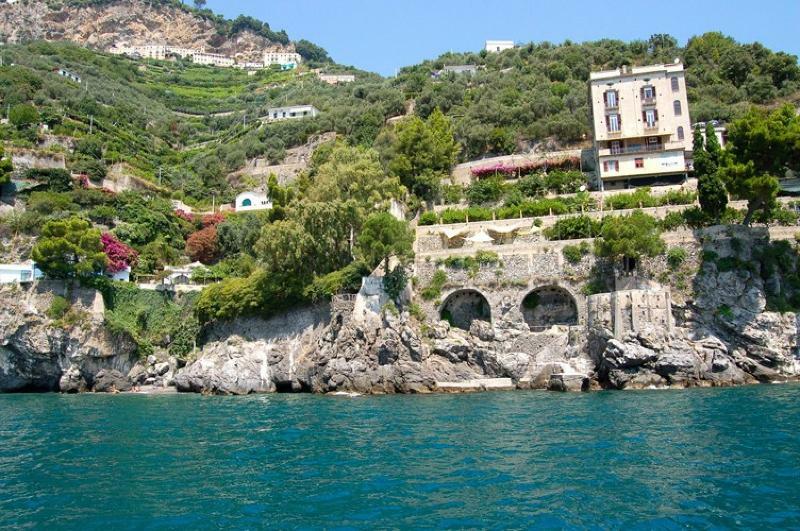 A path of 130 stairs through the lush green park leads to a private access to the sea. The wonderful natural setting which is picture perfect can be enjoyed in all its wonderful essence from the vantage position of the most scenic corner of the property. The Villa's covering terrace leads to a very panoramic roof garden of around 100 square meters provided with a small equipped kitchen, an ideal place to spend unforgettable hours, enjoying the magic of the unmistakable beauty of the surrounding nature. The tourist jetty of Amalfi (the main centre of the maritime connections of the Amalfi Coast) is situated at 2km. from the villa. Including: Parking space for 2 mid sizes cars or for 1 minivan, Private access to the sea, Solariums by the sea, dining room with wine cellar into the rock, 3 full equipped kitchens, 2 gas Barbecues. bed linens and bath towels change twice a week, final cleanings, video surveillance, gardner, fresh flower on arrival, telephone for local call. Visitor Tax: euros 2,80 per person per day (only adults. Over 16 years old: only for the first week of stay). Garage on request (about 100 metres away) euros 20,00 per day for mid size cars and euros 30,00 for minivans. Info & internet point in reception, lobby living room with open fireplace and ancient library, Extra bed: on payment on request.